A purveyor of high-end audio equipment from brands such as Sennheiser and AKG, Headfoneshop is a destination for audiophiles. 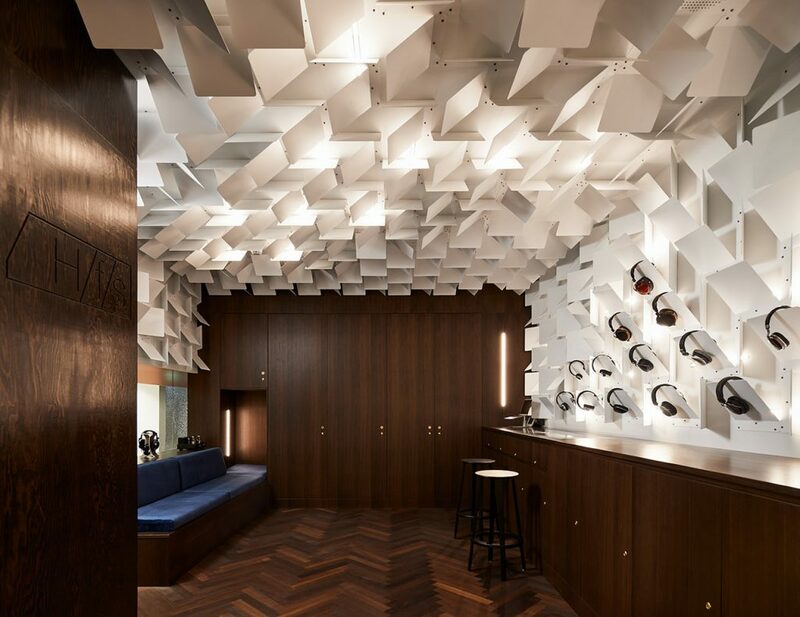 The interior of its new store, located in the base of a 42-story mixed use tower in Toronto’s North York neighborhood, was conceived by Batay-Csorba Architects as a laboratory for aural experimentation designed for the ritual of listening to music. Because Headfoneshop receives far fewer walk-ins than most audio retailers (usually no more than three at a time), the store’s small footprint — 27.8 square meters or 300 square feet — is adequate. Customers are encouraged to bring their own listening devices and linger for hours, pairing them with Headfoneshop’s various headphones, earbuds, and amplifiers while experiencing different types of music. Principal architect Andrew Batay-Csorba (who designed the project along with his partner and wife, Jodi) describes the store’s vibe as somewhere between a jazz lounge and a residential living room: intimate, dark, and tactile. Dark smoked oak herringbone wood flooring from Relative Space (Unopark Smoked Oak Sanded and Oil from Bauwerk) is paired with dark oak millwork, brass fittings, velvet upholstery, and amber-toned lighting. While undertaking this design/build project, the architects conducted extensive research on surface materials. For example, they fabricated the plywood backing for the display with a CNC milling machine, and they experimented with creating a patina for the 765 visible brass screws that attach the metal panels by soaking them in a vat of vinegar and sea salt in their office. They also custom designed a glass display case for Headfoneshop’s high-end ear buds, lined in velvet like a jewellery store display case. Wrapping the walls and ceiling are 255 powder-coated folded metal panels that angle in two different directions and are backlit by recessed LEDs. The wall panels double as retail displays for the headphones, allowing them to be viewed from multiple angles while hiding their wires. This installation wraps the space much like the headphones envelop the user, and it also echoes the enveloping nature of music itself.